The 'spoon bandit' took the plastic utensils from his high school cafeteria. A teenage boy who calls himself the 'spoon bandit,' showed off the fruits of his hard work with a photo posted to Twitter -- which he has since deleted. In the tweet, he writes "I'm chaos. I'm fear. 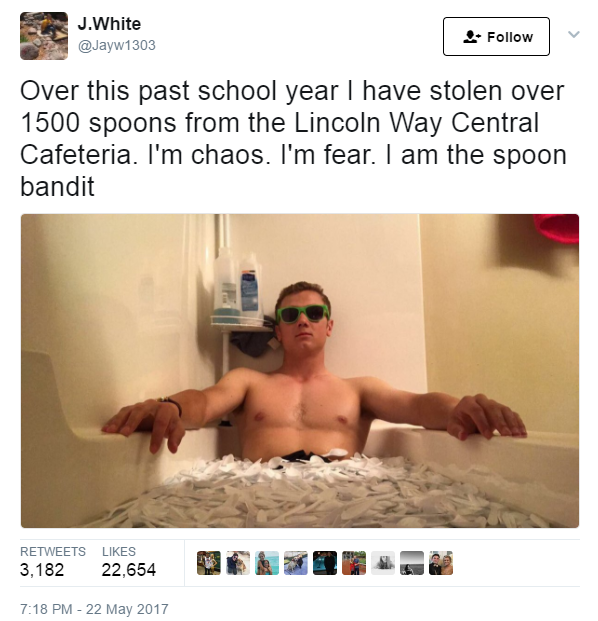 I am the spoon bandit," while laying in a bathtub full of the spoons he supposedly stole from his high school cafeteria, wearing—of course—sunglasses. At first, the young man claimed that over the course of the school year, he stole 1,500 spoons from the cafeteria at Lincoln-Way Central high school in (we think) Illinois. His post prompted other Twitter uses to reply with photos of hoards of stolen wooden door stops and Planet Fitness stickers, while one girl said people like our clever spoon bandit are the reason students at her school have to buy something to get a spoon. See? One bad apple can ruin free spoons for everyone. 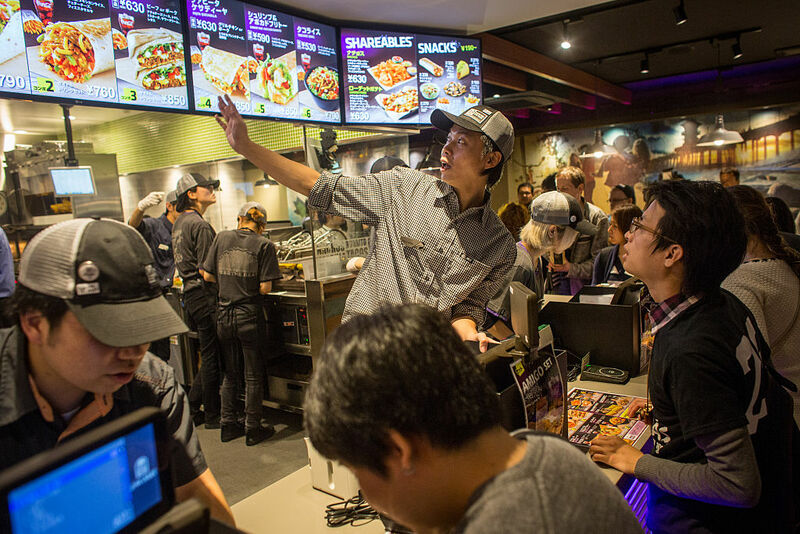 Which brings us to the real point of this story: Could the spoon bandit really have stolen all this loot if it's available for free in the first place? As the initial post gained traction, our marauding criminal mastermind fired off a series of tweets in which he apologized, clarifying that the spoons weren't actually stolen, just "donated" or "recycled," from generous friends who probably just wanted to see if he could get enough spoons to fill up a bathtub. He then showed some love for his school, calling it "the best HS in the country," which seems to imply that he would never take anything as precious as a plastic spoon from his beloved educational institution. In the same tweet, he tells his followers that other people—his spoon heist accomplices perhaps—were being punished for his crimes, which also leads us to believe he had to take down the tweet to protect his, and the school's reputation. But again, how could anyone be punished for taking something that is free? I'm sorry. People I care about are being reprimanded for me taking FREE spoons at lunch. Lincoln Way Central is the best HS in the country. Personally, we admire the spoon bandit's gall, and while we don't condone stealing, if the utensils are, indeed, free, we hope he resurfaces again soon with more loot from the cafeteria. Perhaps a hot tub full of sporks?